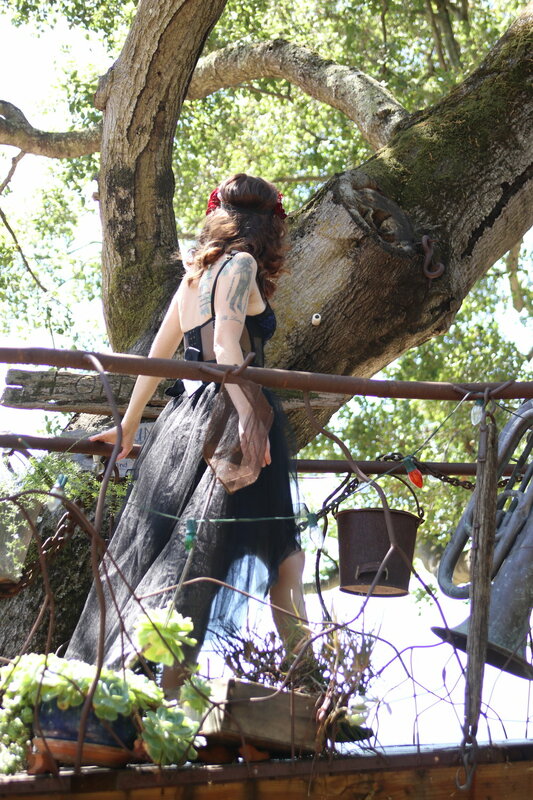 I'm excited to share the second chapter of the treehouse series today, which features a handmade and slightly darker and more Gothic spring look. I get scared very easily by things imagined, and generally stay away from contemporary scary books and movies. However, I do have some healthy fascination with classic Gothic imagery and stories. For a long time, my favorite American author was Washington Irving. I think the fascination might be connected to my New England roots, and the strange magnetism I had growing up for the darker side of the region's history, like the Salem witch trials. I suppose I like my danger far, far away, both in space and time. I had this skirt made to order several years ago by an Etsy seller in China called Coco Tutuhouse. I can't speak highly enough of her skill! She and I communicated about my measurements and the concept over email, and the turnaround on the construction and shipping was under two weeks. The skirt has held up quite well over time with lots of use, and I have styled it both on its own as well as under an Adrianna Papell ball skirt I like to wear in the winter around the holidays. There is certainly something surreal about an all black ensemble in late spring, especially in the forest. I love the way it makes my heart race a little bit to imagine what series of events could unfold under these circumstances. Nothing too terrifying of course, because I like my Gothic dreams to have happy endings. 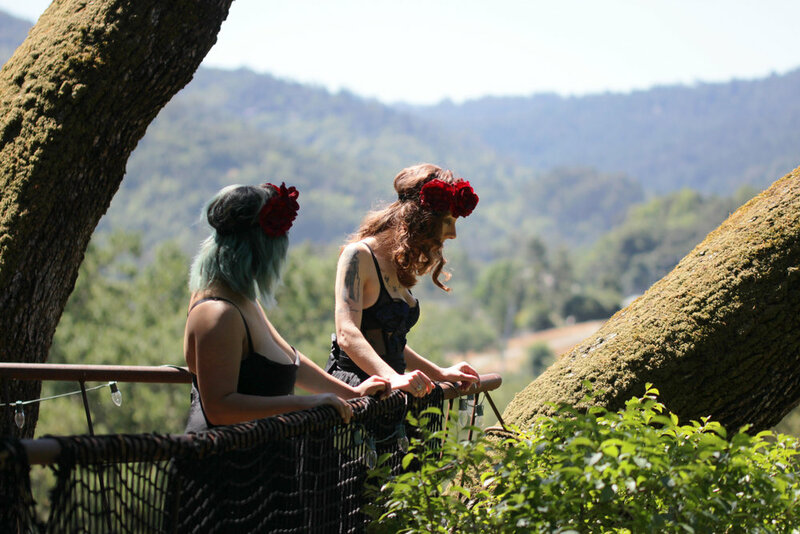 My vintage soulmate Meileena (find her on Instagram as @musemeileena) and I spent the better part of a magical day in the Santa Cruz mountains recently, working on a series featuring vintage, local, and handmade pieces that celebrate the beauty of springtime in the forest. I will be sharing all of our looks over the upcoming weeks in a series I've decided to call the "Treehouse Series." One of the most whimsical aspects of the property where we shot our looks was a set of two little treehouses, which were absolutely full of the best inspiration for this series. This first chapter takes its name from the beautiful fabric of both our garments. My romper and Meileena's chemise are by Evgenia Lingerie, designed and made locally in northern California by a friend of ours. Evgenia is some of the most decadent, sumptuous lingerie I have ever worn. It flatters every figure and the designs are elegant and timeless. California is having the most incredible super bloom this spring, since heavy rains finally arrived after so many years of drought and utterly soaked most of the state all winter. Now that the sun is shining again, flowers (and allergies, it seems) are blooming with incredible abundance. The night garden print feels just right during this particular spring, when flowers are such a source of visual delight for anyone who steps outside. This series is a nod to the slow fashion revolution, and the desire to break away from what is trend-driven and mass-produced. We hope to show you how elegant it can be to choose deliberately and fall in love with what you wear. Be inspired, and you will become the most beautiful version of yourself!